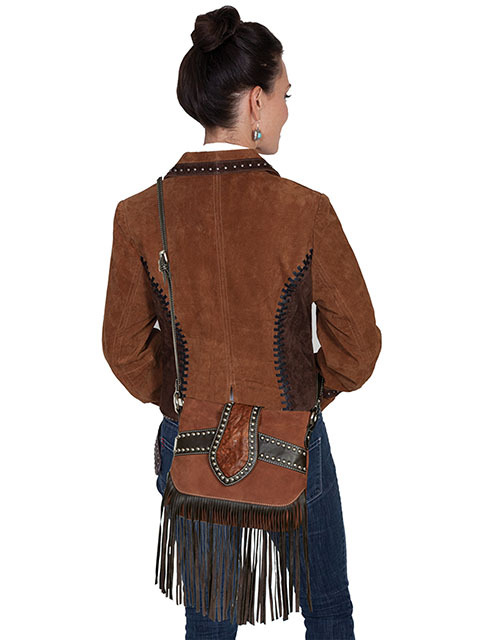 Suede and leather trim fringe handbag. Sumptuous soft brown suede contrasted with black leather trim and fringe is a must have bag. It features a wide tab with tooled leather and leather studded trim with a magnetic snap closure. It also has a top zip closure to secure your things. The interior features a black cotton lining with a contrast off white stitch with two roomy open pockets and a full zip pocket. Adjustable shoulder strap with a drop length of 24".